It’s time for another success story. I’m sitting on tons of these. 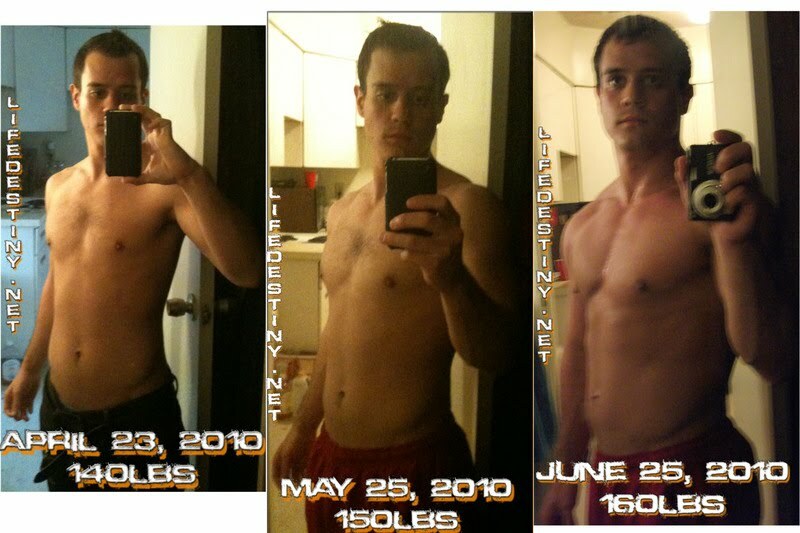 People are getting amazing results following the Leangains guide and I’m stoked to see success stories dropping in by the dozen. This one is pretty damn impressive. I was quite pleased with my results after an intermittent fasting style “bulk” back in 2006. I gained about 20 lbs of weight in a little more than three months. When I did the math, I came to the conclusion that the ratio of muscle:fat gain was approximately 2:1, meaning 67% of the weight gained was muscle. What’s a standard ratio of fat and muscle gain for the average weight trainer with a non-retarded diet and training routine? Based on the DXA readings I’ve seen from some folks that have been tracking this, I’d say about 50-60% of the weight gain is typically muscle. With that in mind, I certainly didn’t complain. Even though I did gain some fat, I started out very lean and ended up lean – with a lot of extra meat on my bones. Heck, my results after that bulk inspired the name of this site (which is a tad ironic, since most people are using my approach to cut). However, my results pale in comparison to those of Tanner Maluchnik. Without futher ado, I’ll just let him tell you his story. Though I personally have not consulted Martin on my IF approach, I have learned everything from him by reading his blog from start to finish including a majority of the comments. A little over 6 months ago I started eating paleo nutrition style, I was sitting around 170lbs of a short (5’6″) and stocky muscle and fat. Due to personal reasons, I stopped working out and eating very clean paleo style. I dropped my weight down to an unhealthily 135lbs in a matter of a couple months. Tons of muscle mass as well as fat dropped off while following the paleo nutrition lifestyle along with my own form of intermittent fasting – as in, I ate whenever I felt like it. Which was like once a day probably only consuming 800-1200 calories at most. I felt excellent from eating the clean paleo foods but I knew this was just not an healthy lifestyle, being sedentary and eating so little. No matter how clean. Tanner at about 170 lbs back in October. This was before he dropped a ton of weight by undereating. A little over 3 months ago I decided to get back into my passion. Strength training and nutritrion. Throughout my life since 7th grade I have always been in some form of strength training program for baseball, football and hockey. Then in college I decided to join the cheerleading squad for a large Big 10 University and was in decent shape through all of that. So my base and knowledge of many different routines, styled to quite a few different sports and activities, was there. However, I decided to pick up a few books, specifically Supertraining, Starting Strength , The New Rules of Lifting, and also read Martin’s entire blog (could not afford his consultation at the time), Alan Aragon’s work, and Lyle McDonald’s work. I devised my own strength training program of sticking to the basic compound movement: squats, deadlifts, standing overhead military, bench press, incline press, and bent-over rows. A lot of what I do I learned from Martin as well in the sense that I do not worry about the accessory exercises and focus on compound movements. However I am not currently on a high-intensity approach. I train fasted with 10g of BCAAs beforehand (per Martin’s recommendations and research study he provided) and have never felt stronger. I devised my own nutrition program based on what I learned from Martin, Alan, and Lyle. The paleo lifestyle had its merits while I could afford it, but at the moment I find that I am not sensitive to grains, nor carbs, and find my strength and weight climbing up nicely in a high carb/high protein/low-moderate fat routine. I strongly believe the intermittent fasting approach provides wonderful insulin sensitivity with its nutrient partitioning effects. I came into the intermittent fasting approach from a different perspective than a lot of others on this approach as I wanted to put on as much weight as fast as possible while limiting body fat gain. While going from 140 lbs to my current weight of 164 lbs in a little over 65 days, there has been no increase in pant sizes and no increase using two different body fat calipers (Jackson-Pollock 3 Point skinfold measure). I eat tons of “unhealthy” stuff such as sugary cereals (just love em), lots and lots of plain bagels, pasta, lots of protein, and some healthy fats. My post-workout meal is around 2500 calories with around 300g carbs and lots of protein. After that, I eat whenever I am hungry again which is usually within the hour or two. If you want to see some of the psychological and physical benefits I had on intermittent fasting before my recent mass building phase, I actually did a blog post on intermittent fasting on my blog. Some of the guidelines in that post have changed since I have changed my approach to intermittent fasting a little bit. I can truly attribute a lot of my progress to what I have learned from Martin at leangains.com and am thinking of setting up a consultation with him whenever I can afford it. I am now at 164 lbs at a little over 65 days from the first picture. I have never had abs before intermittent fasting but the top 4 are showing through on this lean mass building phase. The abs are solid from top to the bottom from just strictly heavy deadlifts, squats, weightup pushups and chinups. I seem to actually have leaned out a bit as well, which I guess sounds crazy. Over 20 lbs of lean mass AND body fat loss in a little over 60 days possible? The only explanation in my mind is the intermittent fasting approach and my previous base and years of strength training. I am also quite an easy gainer if I incorporate heavy weights. Just got out of a new gym today hitting that, when I get to around 6 to 8 reps I will add 10lbs to lifts like squats, deadlifts, bench. Bench Press – I was struggling on progress here so switched up my workout routine to include two bench sessions a week. Needless to say, Tanner had jaw dropping results following the Leangains approach with a few modifications of his own. 24 lbs of muscle, probably more since he looks leaner in the most recent picture, is almost unheard of. However, it’s important to have in mind that Tanner started out fairly emaciated and untrained. With that in mind, he had a lot of room for improvement. The more muscle you have, the slower the gains will be, and vice versa. I’ve seen similar results (rapid weight gain, most of it muscle) in beginners, and it’s not a stretch to put Tanner in that category. Once he upped his calorie intake and started weight training, he blew up. The fact that he had prior weight training experience, from before his undereating phase, certainly might have helped. Also, a short comment on the paleo diet for muscle gaining. Tanner’s experience with the paleo diet should not be interpreted as him being anti-paleo. However, some people have a hard time getting sufficient calories in when adhering to exclusively paleo-based foods. For that reason, they ultimately fail to gain any appreciable amount of muscle mass – especially in combination with intermittent fasting. Personally, I don’t have such a problem. I can eat enough meat, veggies and berries to satisfy a small village if I have to. By the way, for another example of rapid muscle gain, check out Neto’s results. He too gained a lot of muscle once he upped his calorie intake after a very long diet stint. And whenever someone says “ya can’t gain muscle with fasting”…just direct them here.